A gentle cleanser containing ingredients which effectively removes surface oils and dirt, leaving your skin feeling clean, fresh and hydrated. Specially formulated to clean the tattoo area. Suitable for all skin types. An intensive restoring gel specially formulated to assist in the restoration of newly tattooed skin. A unique combination of revitalising ingredients helps to enhance the healing of the damaged skin. Suitable for all skin types. A uniquely formulated moisturiser containing Shea butter, deep moisturising materials and peptides to help strengthen the skin structure and contains a unique patented active ingredient that assists with the regulation and retention of the moisture in the skin. 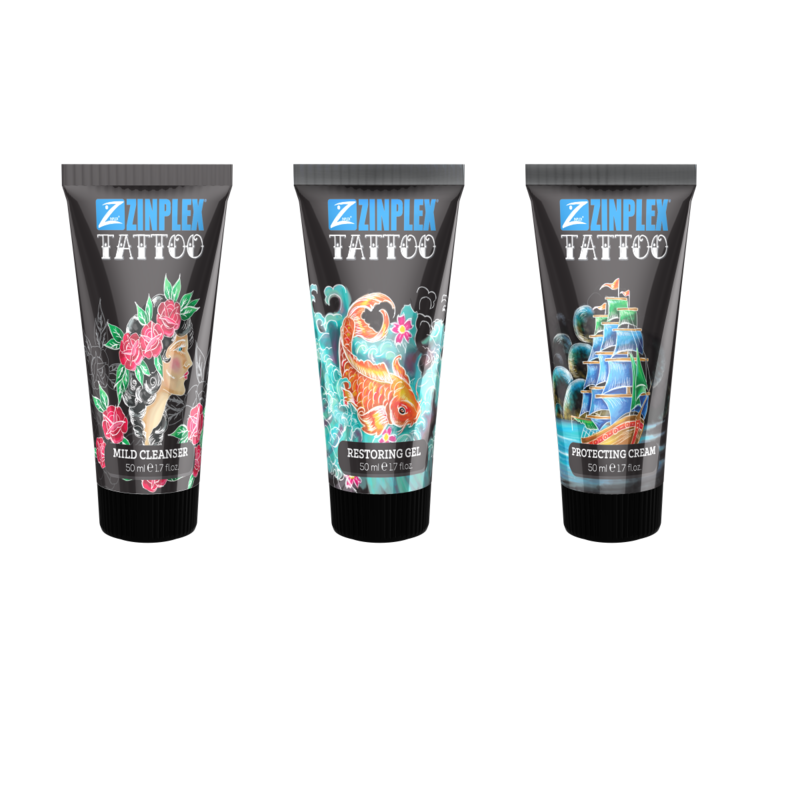 Regular use can improve the overall reduction of skin roughness and intensify tattoo appearance. AQUA (WATER), TEA-LAURYL SULPHATE, COCAMIDOPROPYL BETAINE, COCAMIDE DEA, GLYCERIN, ACETIC ACID, ASCORBIC ACID, CAPRYLIC ACID, LACTIC ACID, ALCOHOL, CITRUS AURARITIUM, AMARA (BITTER ORANGE) FRUIT EXTRACT, YUCCA SCHIDIGERA STEM EXTRACT, BISABOLOL, ACRYLATES/VINYL ISODECANOATE CROSSPOLYMER, TRIETHANOLAMINE, LINALOOL, LIMONENE. AQUA (WATER), PANTHENOL, PEUCEDANUM OSTRUTHIUM LEAF EXTRACT, CITRIC ACID, ACETIC ACID, ASCORBIC ACID, CAPRYLIC ACID, LACTIC ACID, ALCOHOL, CITRUS AURANTIUM AMARA (BITTER ORANGE) FRUIT EXTRACT, YUCCA SCHIDIGERA STEM EXTRACT, CARBOMER, BISABOLOL, CAPRYLYL GLYCOL, PHENOXYETHANOL, TRIETHANOLAMINE. AQUA (WATER), PETROLATUM, CETEARYL ALCOHOL, PEG-20 STEARATE, BUTYROSPERMUM PARKII (SHEA BUTTER), GLYCERIN, SACCHARIDE ISOMERATE, PALMITOYL TRIPEPTIDE- 5, TOCOPHERYL ACETATE, BISABOLOL, PANTHENOL, CARBOMER, TRIETHANOLAMINE, CAPRYLYL GLYCOL, PHENOXYETHANOL, LINALOOL, LIMONENE. After cleansing gently massage into the tattooed area. Take care to avoid the sensitive eye area.